Citrine is associated with the second, or Sacral, Chakra. This chakra is located below your navel along the lower area of your stomach. The second chakra is associated with sensuality and sexuality, reproduction, desire, emotions and creativity. Citrine is also associated with the third Chakra which is also knows as the Solar Plexus or Power Chakra. This chakra is located below the breastbone, affects abdomen, gallbladder, small intestines. The Power Chakra is associated with ego, intellect, ambition, personal power, fear and protection. 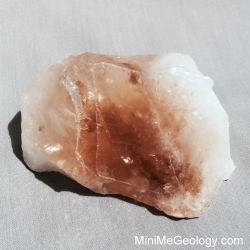 Citrine is also associated with the seventh Chakra, or the Crown Chakra. This chakra is located at the top of your head and associate with enlightenment, cosmic consciousness, energy, perfection, spirituality and intelligence. Stone Color: Orange / Golden-Yellow / Golden-White.